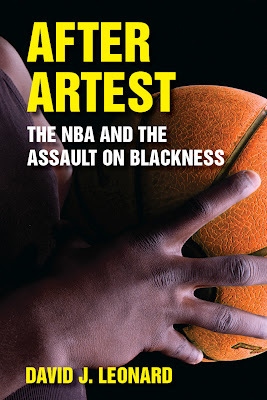 After Artest explores how the NBA moved to govern black players and the expression of blackness after the “Palace Brawl” of 2004. On November 19, 2004, a fight between NBA players Ron Artest and Ben Wallace escalated into a melee involving several other players and many fans. The “Palace Brawl,” writes David J. Leonard, was a seminal event, one that dramatically altered outside perceptions of the sport. With commentators decrying the hip hop or gangsta culture of players, the blackness of the NBA was both highlighted and disdained. This was a harsh blow to the league’s narrative of colorblindness long cultivated by Commissioner David Stern and powerfully embodied in the beloved figure of Michael Jordan. As Leonard demonstrates, the league viewed this moment as a threat needing intervention, quickly adopting policies to govern black players and prevent them from embracing styles and personas associated with blackness. This fascinating book discloses connections between the NBA’s discourse and the broader discourse of antiblack racism. Particular policy changes that seemed aimed at black players, such as the NBA dress code and the debate over a minimum age requirement, are explored. “The power of the event is that it changes everything. So it is, David Leonard demonstrates in After Artest, in the post-Palace NBA. When Ron Artest went into the stands in the Palace of Auburn Hills in that fateful game in 2004, he not only subjected himself to unprecedented punishment, he also altered the entire discourse of race in the NBA.